Long after the ruckus of Sunday's St Patrick's Day parade has dissipated, the reverberations from the biggest Irish celebration in the Southern Hemisphere will still be heard around the city of Sydney. You don't have to spike your beer with green dye or wear a comedy beard. Instead, why not keep things verdant for the rest of the week just by vying for dishes hued between blue and yellow on the colour spectrum. Cover yourself in good luck and pluck a leaf from my clover of four places sending green shoots around the city. The Pazar Food Collective is not remotely Irish. It's a little bit Mexican, a little bit Middle Eastern and according to The Sydney Morning Herald's 2015 Good Food Guide "a globe-trotting neighbourhood street food party". You don't have to wear an oversized lime-green top hat to enjoy a few raspados (Mexican snow cones with frozen green fairy floss and a jigger of gin, cucumber, lime and mint). The moat of aquachile verde surrounding sushi-grade scallops will, to be sure, call to mind the lush green landscape of Ireland. 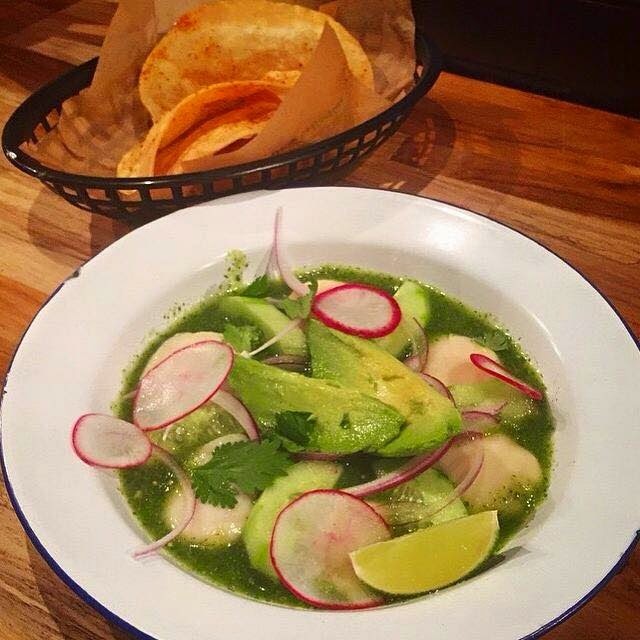 The ceviche-style salsa verde includes jalapeños, coriander, tomatillos, lime juice, orange juice, habanero and tequila. The salsa is bright green and the strategy is simple: scoop up the scallops with some salsa and fresh avocado, which cut through the heat. Chilli crab rocket linguine gets its green on at The Italian Stallion. Step away from the kale smoothie and embrace chilli crab rocket linguine at The Italian Stallion, one of my new favourite restaurants in the Shire. There is nothing gimmicky about chef James Watson's decision to ink this dish green using 'rocket'-fuelled chlorophyll. This is upscale comfort food at its finest. Watson launched his culinary career working for UK chef Gordon Ramsay at Aubergine and at St John Restaurant in London, but he is now in the spotlight for giving Gymea a place to genuflect. Toast the mother country at the bar under the Cocktails and Wet Dreams sign and order a Little Prick, with fresh prickly pear, lime, tequila, agave nectar. Legend has it, the cocktail was apparently inspired by a rather nasty leprechaun. 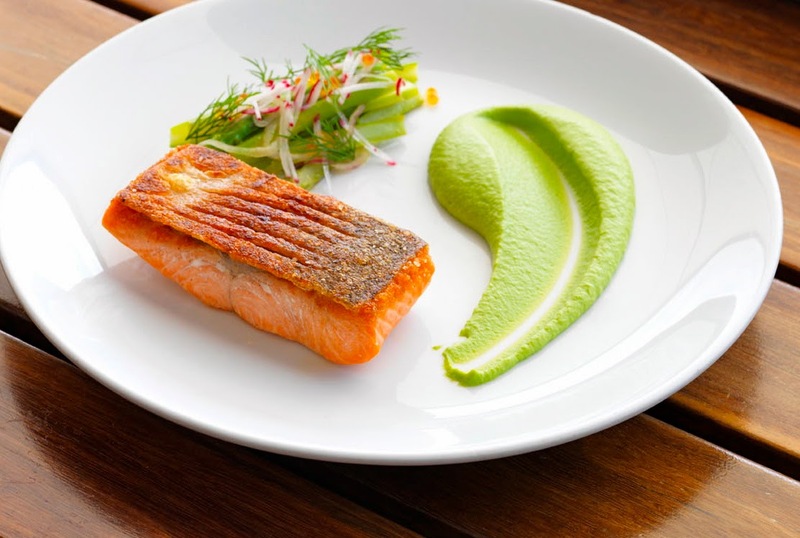 Curled like a comma on the plate ... pan-fried ocean trout with a lick of iridescent pea puree. Hugos in Manly is one of Sydney's most desirable dining destinations. Whether you are from Dublin or Dingle Bay, those feelings of homesickness may just abate while ensconced on the brand-spanking new deck at this iconic Sydney restaurant. Opt for pan­-fried ocean trout with iridescent pea puree curved like a comma on the plate alongside a salad of shaved asparagus, radish, eschallots and salmon roe. Impress your date by arriving via ferry at the new deck where diners can hear the gentle slap-slap-slap of the water against the pier, which pimps up the picturesque views over Sydney Harbour. Corned beef at Kitchen by Mike. It's not about the tablecloths and cutlery at Kitchen by Mike. Housed in a former Rosella Jam factory, the main focus here is on seasonality, simplicity and freshness. Food doesn't get much greener than when much of it is grown onsite in burgeoning beds where chef Mike McEnearney conducts educational classes. Although the spread changes from day to day according to the seasons, there are some items you expect to see: award-winning rustic sourdough, tartines, quiches, wraps and rolls as well as corn with lime and chilli. 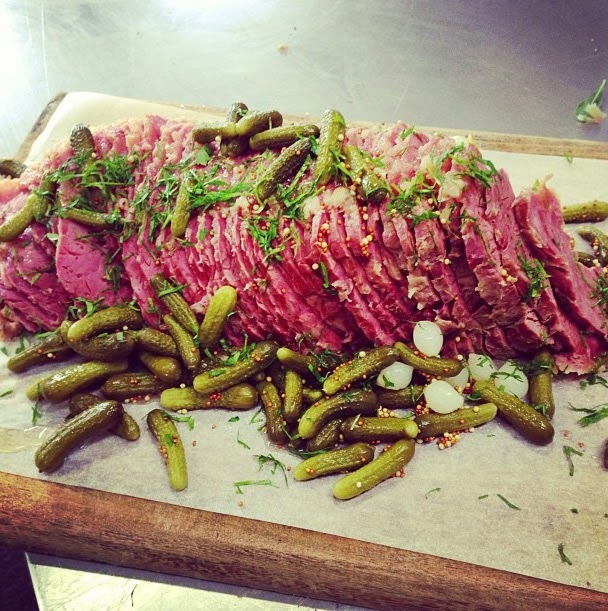 Corned beef is also a go-to dish to enjoy on St Patrick's Day and worth coming back for any time of year. Visit Good Food to find more places to have a good craic and check in at www.carlagrossetti.com if you'd like to read more of my work.